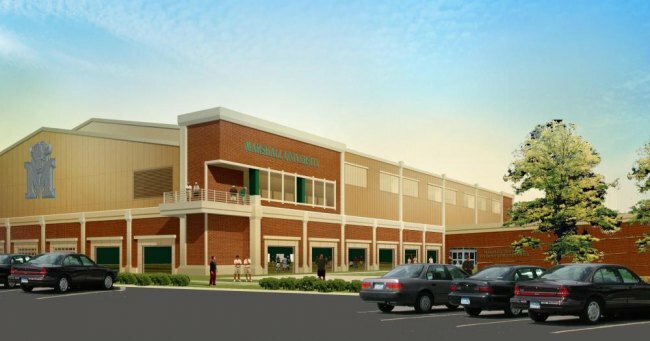 HUNTINGTON, W.Va. – The Marshall University Board of Governors approved plans for a more than $30 million project Thursday that includes a state-of-the-art indoor practice facility with an indoor track, an academic center, a sports medicine translational research center and a soccer stadium complex for Marshall Athletics. The projects include $10 million for renovating the historic Anderson Newcomb (Stone & Thomas),seven story structure opposite Pullman Square, into a state of the art Fine Arts Facility. The new applied engineering complex and a vertical parking garage likely next to the Joan C. Edwards Performing Arts Center. Bonds for the projects , which were unanimously approved by the Board of Governors, could be sold in September. “This is a historic day for Marshall University Athletics,” Director of Athletics Mike Hamrick said. “We are excited about each of these new facilities and are looking forward to having them in place in the near future. This project will have an enormous impact on every one of our athletics teams and every student-athlete. This is only the first step in addressing our overall facility needs. The project will be funded by bonds and private gifts, and is part of a larger bond issue that includes academic facilities on the Huntington campus. The first phase of the project involves $5.4 million that will be used to demolish the Veterans Memorial Field House and construct a soccer stadium complex on that site and include a veteran’s memorial park. The Greater Huntington Park & Recreation District Board voted unanimously to turn the land over to Marshall Athletics on Wednesday night at no cost. The Field House had fallen into disrepair and was becoming a financial burden on the parks department. Construction of an indoor practice facility with a full competition track, artificial playing surface and an athletics hall of fame at a cost of $14 million will then begin adjacent to Joan C. Edwards Stadium on the current site of Sam Hood Field. A $3.5 million academic support center and a $7.5 million Sports Medicine Translational Research Center will be included at this site. All told this project will provide Marshall student-athletes with state-of-the-art academic, athletic, training, and sports medicine facilities that are among the best in the nation. The first phase of the project is expected to begin in February 2012.